This painting captures the staccato rhythms of a modern urban environment, and the broad panorama of its buildings, scaffolding, and bridges. These architectural elements are punctuated by such signs of city life as shop window mannequins, rounded plumes of smoke, and a telephone pole, all rendered in bold, vibrant colors. Léger even included his own initials, "F L," among the array of stenciled letters, evoking the colorful billboard posters of the time. Picasso and the Avant-Garde in Paris: Fernand Léger's "The City"
Fernand Léger has been aptly called the preeminent painter of the modern city. He developed his brightly colored, machine-inspired style at a time when cities, including his native Paris, were taking shape as the dynamic complexes of sensation we experience today. The City is Léger's master statement celebrating the vitality of modern urban life. In it he has synthesized identifiable facts of the city's appearance--billboards, apartment buildings, scaffolding, billowing smoke, and a telephone pole--with irregular abstract shapes in vivid hues. The clash, overlap, and rapid jumps among the shapes and colors borrow from the cinematic techniques of quickly cutting between scenes, and the inclusiveness of the composition resembles the panoramic sweep of a movie camera. This is not so much a particular city represented as the essence of the urban center as a site of overwhelming simultaneous impressions. John B. Ravenal, from Philadelphia Museum of Art: Handbook of the Collections (1995), p. 315. 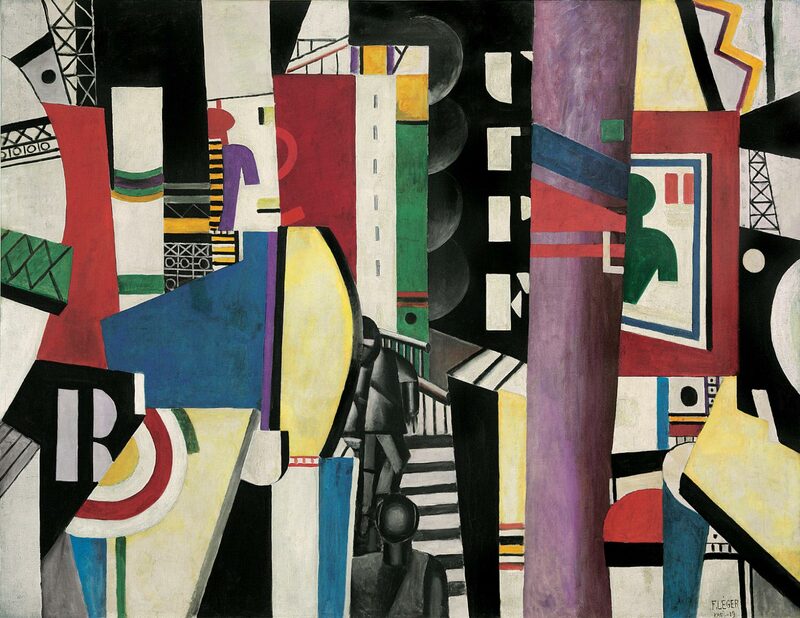 The staccato rhythm of Léger's The City produces the sensation of living in or moving through a machine-age urban environment. Visual and aural stimuli condense into a kaleidoscope of shallow, overlapping planes, signs, and fragments. The abbreviated city sights, mechanical elements, and abstract forms deliberately lack natural continuity or sequential coherence. The monumental scale of the canvas envelops the viewer like a theater backdrop, inviting us to join the mechanized figures climbing the staircase in the foreground in order to enter this bustling modern metropolis. The fragmented cityscape is illuminated by the intensity of Léger's palette—vivid hues suggesting the dazzle of modern advertising and the glare of street lighting. The taut, geometric composition is built up with distinct areas of flat, unmodulated colors that produce depth and movement without resorting to the traditional chiaroscuro method of modeling light and shade. The scaffolding, buildings, steel structures, bridges, billboards, shopwindow mannequins in silhouette, rounded plumes of smoke, and telephone pole are rendered in primary reds, yellows, and blues contrasting with vibrant greens, purples, and grays. Passages of black and white separate the blocks of pure tones into individual compartments, with contrasts and ruptures evoking the density of the city. The pungent blacks provide graphic clarity, while the extensive use of white provides an optical light that appears to burn from within the picture. The artist has included his own initials, "F L," among the chaotic jumble of stenciled letters, recalling the colorful posters of the Place de Clichy, where Parisians are bombarded by a deluge of advertising billboards and commercial signs. Twentieth Century Painting and Sculpture in the Philadelphia Museum of Art (2000), p. 53. A. E. Gallatin, New York, purchased from the artist, with the assistance of George L. K. Morris, 1936 ; bequest to PMA, 1952. 1. See letter of January 1937 in which Léger informs Gallatin that the painting has been shipped (Gallatin Papers, New York Historical Society, microfilm). Morris owned a half share of the painting (along with Picasso's "Three Musicians"), which he later sold to the Gallatin estate; see Gail Stavitsky, The Development, Institutionalization, and Impact of the A. E. Gallatin Collection of Modern Art [Ph.D. dissertation, New York University], 1990, v. 2, p. 356-357, and v. 7, p. 143.